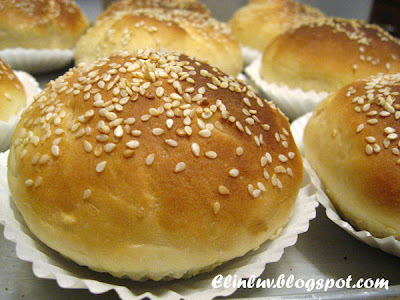 Anyway, it took me just about 2 hours to make the buns from scratch. And the beef patties, it took me about an hour to make them and freeze them in the freezer for use later. And another hour to get myself ready for our dinner :p And all the hard work pays off. of ocurse this is mine ! Fry the onion with some olive oil in a pan for few minutes until softened. When the onion completely cool down, mix it to the meat. Shape the meat into the size you like and place on a tray with greaseproof paper. 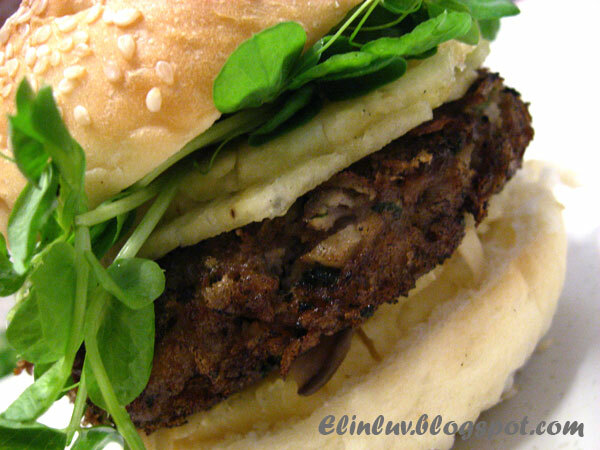 Sprinkle some bread crumbs on top of each burger and press down gently. Chilled in the fridge for 3-4 hours or in the freezer if not using it immediately. 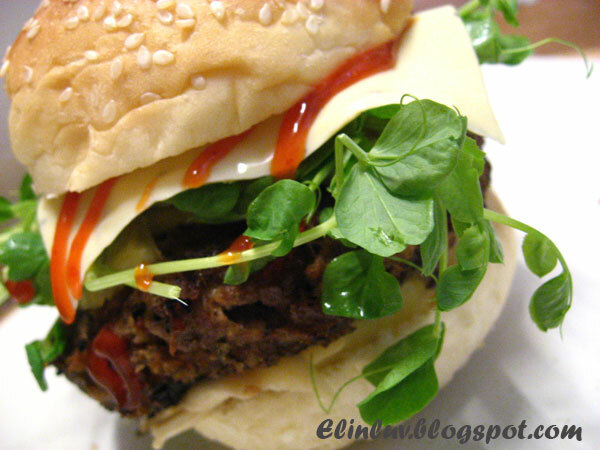 Fry the burger in a little oil on medium high heat for few minutes, depending on the thickness of the meat. To assemble the burger, spread some salted butter on the buns and grill it on a griller or pan fry for a few minutes until it slightly turn crisp. 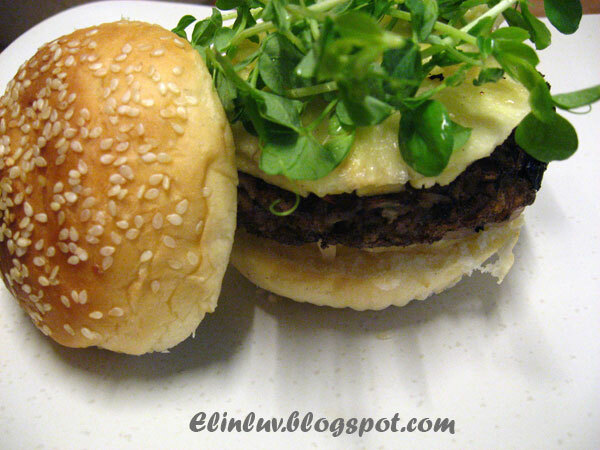 Spread some djon mustard or mayonnaise on the bottom part of the buns and then top with some lettuce. Layer with the meat then follow by cheese kraft and freshly sliced tomato and finally the top part of the buns. The giant burger! A favourite meal of my husband's. Delicious, delicious, delicious...!! 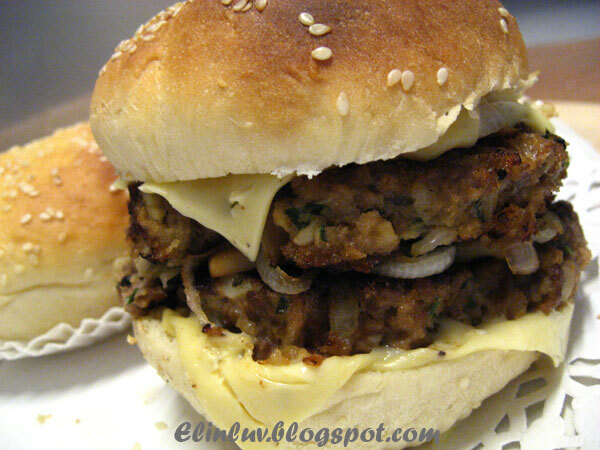 Haven't had burgers for a long time, you make me drool for one now! Wow. I love that you made your own buns too. They look perfect. Maybe you should open a diner or burger truck! WOW! Thanks for trying out the recipe. I'm so happy that you have got nice burgers. Really great job with some modification of the ingredients. Good try and I would love to try your recipe too! Thanks for sharing your great success! Those look very filling! Yum. 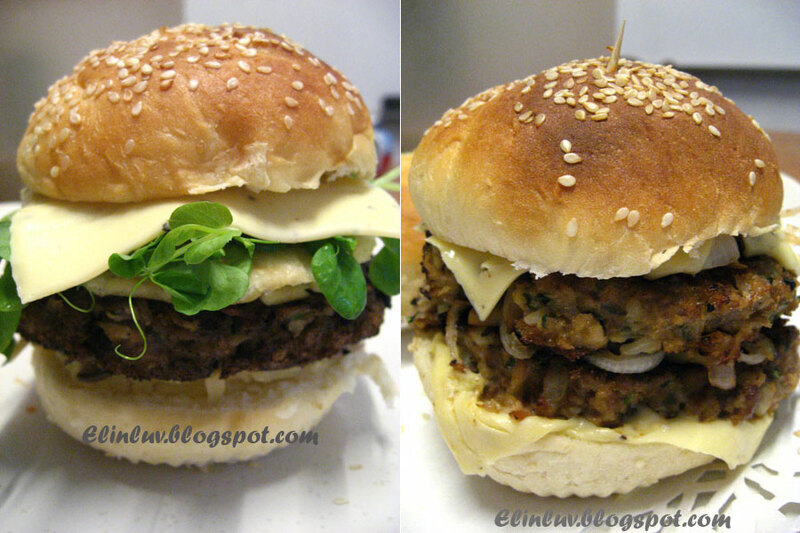 another homemade burger!! Oh i don't mind paying for that! looks good!! Well done! The burgers look amazing! Wonderful recipe, Elin! Thanks for sharing! Love the idea of having pineapple slices in there. Great Job Elin! Am in awe 'cos you even made the burger buns from scratch!